The Society for Ethnomusicology announced today the inauguration of its official blog, Sound Matters. I guess that ethnomusicology has reached 2005? But seriously, it’s great to see a more quick-moving, vibrant, and publicly-accessible avenue for publishing engaging materials about music in all its forms. We’re seeing more public, digital music projects like this that have scholarly imprimatur but lean to the accessible, like “From the Field” and “Blogging Ethnomusicology.” I’m glad to see SEM’s continuing support for this sort of work. The Society for Ethnomusicology is pleased to announce the launch of Sound Matters: The SEM Blog. Hosted on the SEM website, the blog offers content on a variety of subjects related to music, sound, and ethnomusicology. SEM seeks lively and accessible posts that provide both stimulating short-form reading for ethnomusicologists and outreach to readers beyond the academy. We encourage authors to consider this forum a unique opportunity to transcend the boundaries of traditional print journals with brief works that integrate hyperlinks and multimedia examples. All content will be peer-reviewed. The inaugural post for Sound Matters is “From Scholarship to Activism in Zimbabwe,” by Jennifer Kyker of the University of Rochester. In this multimedia document, Professor Kyker examines how music and dance are critical to the work of a non-profit organization in Zimbabwe called Tariro, which supports education for teenaged girls and HIV/AIDS prevention. One can’t help a very brief review: they could have devised a prettier URL pattern, I don’t see any prominent space to track pingbacks or other sharing (though comments appear to be allowed), and the ShareThis widget’s buttons at the bottom of the posts could use a bit of tweaking (currently no tumblr, wordpress, or other share options appear immediately when I viewed the page, but this could be influenced by my cookies). Otherwise, this looks like a great project off to an auspicious start under the able advisement of a great team of editorial advisors including a representative from RILM’s Bibliolore. Just noticed this beautiful post about the charango, a small South American lute. A nice YouTube clip, but topped off with the most amazing picture of an action figure above a giant-looking charango. Worth a click! The 2009 volume (41) contains a review essay, “Blogs by Ethnomusicologists,” by Barbara Alge (pp. 265-268). I wasn’t excited only because my fieldwork blog was listed on Alge’s blog, Blogging Ethnomusicologists, but also because it seems that blogging is receiving more recognition as a medium that plays a role in academic music circles. The review offers “insights into some blogs created by ethnomusicologists” (265), and Alge’s blog contains links to almost one hundred blogs maintained by ethnomusicologists. 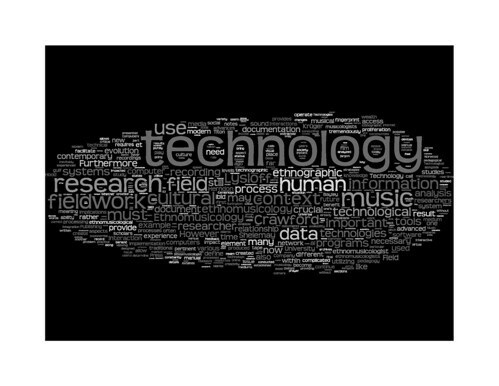 Although Alge suggests that “deep understanding is hindered by the often randomness of the information” gleaned from blogs, she concludes that blogs “can indeed have relevance for ethnomusicology” when used as “knowledge management tools” (268).